The history of the Balkans has been tumultuous basically from the ancient times. From the 14th to the beginning of the 20th century, most of the Balkan Peninsula was influenced by the Ottoman Empire. In the second half of the 19th century, Turkey lost almost all possessions in the Balkans, but it was not until 1912 that Albania gained independence as a result of the First Balkan War. Although countries situated on the Adriatic Coast differed politically, the years of common history, ethnic similarity and short distance resulted in lively economic relations. In the beginning of the 20th century trade between Croatia and Albania was booming, and numerous cargo and passenger ships sailed across the Adriatic Sea. One of such ships was Brioni, built in 1909 in a shipyard in Monfalcone, located in the north of Italy, to the order of the biggest Austro-Hungarian transport company, the Österreichischer Lloyd. During the World War I the steamship along with the entire company to which it belonged, got into thr Italian hands and sailed as a cargo ship of the Italian navy. After the World War I and the fall of Austria-Hungary, the company remained Italian and continued to function under the name of Lloyd Triestino (since 2006 Italia Marittima, currently part of the Taiwanese conglomerate Evergreen Group). 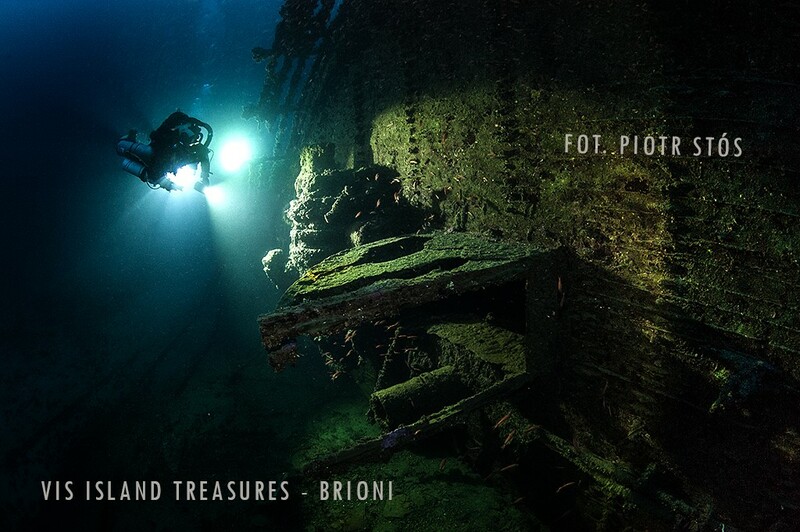 For six years after World War I, Brioni sailed in his fleet, to be sold in 1925 to the shipping company of Apulia (Societa di Navigazione a Vapore Puglia) and continue cargo and passenger cruises on the Adriatic. In February 1930 the ship, carrying tobacco and wine, sailed out of Split on its last cruise. 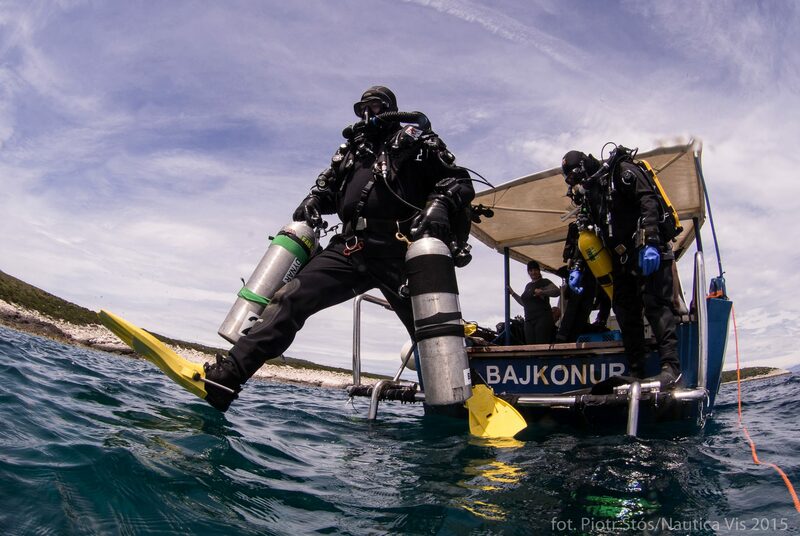 On February 2, when the visibility was very poor, Brioni hit the south-eastern cape of the islet Ravnik, located about 0.5 nautical mile from Rukavac – a village on the island of Vis. The ship sank quickly and ended up on the sandy bottom about 50 m off the shore. Brioni lies on the left side, facing the isle with the stern, which is only 10 m away from it. 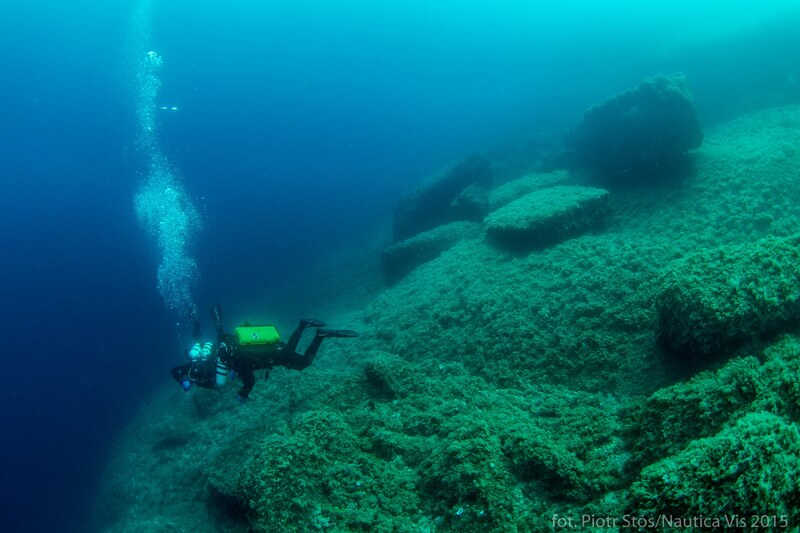 In the shallowest place on the wreck the depth of 38 m can be found, in the deepest spot – 65 m. With its 9 m width, the unit is over 68 m long, and during no decompression recreational diving divers can see no more than one third of the wreck. Diving in this place usually starts close to the cape almost above the wreck and ends in a quiet bay, where diving boats can anchor. In the bay, on the bottom of which there are boulders of different sizes, small scorpionfish, octopuses and various sea stars can be found. 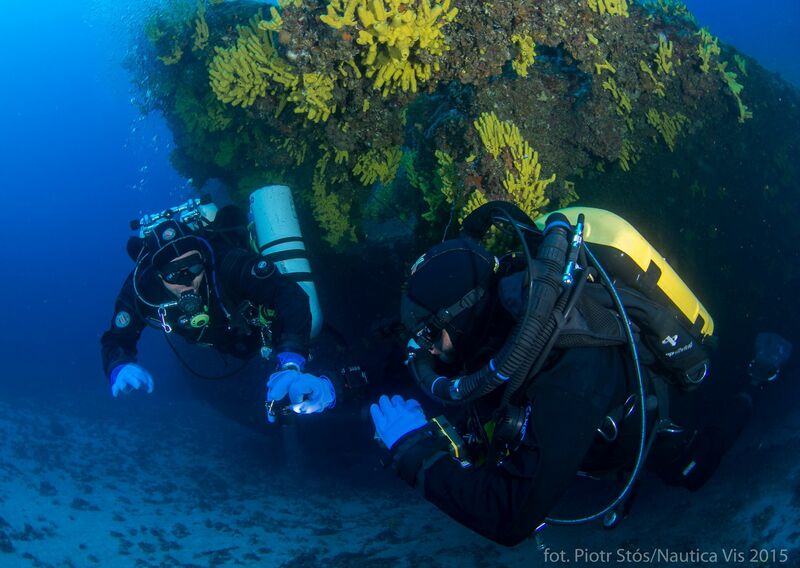 Under the rocks, in turn, there are hiding animals usually seen during night diver, like for example brittle stars. 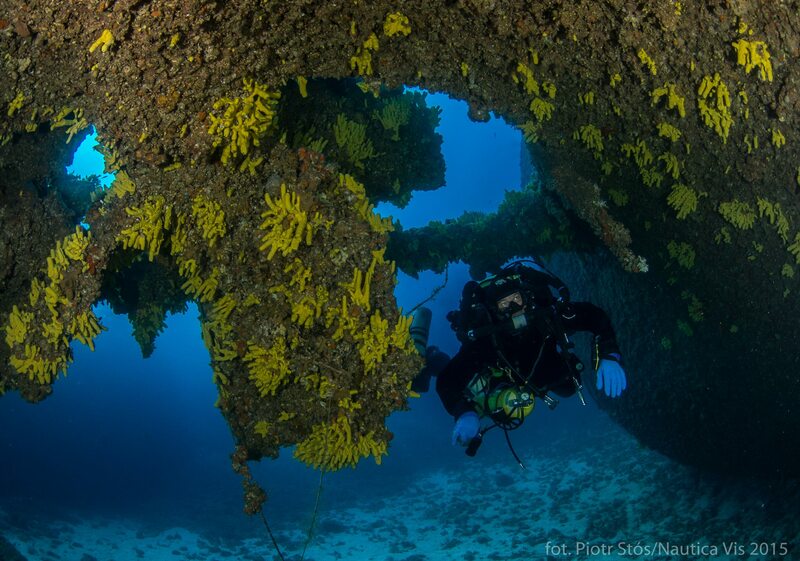 From the wreck to the wall the divers swim along the wall with numerous holes. 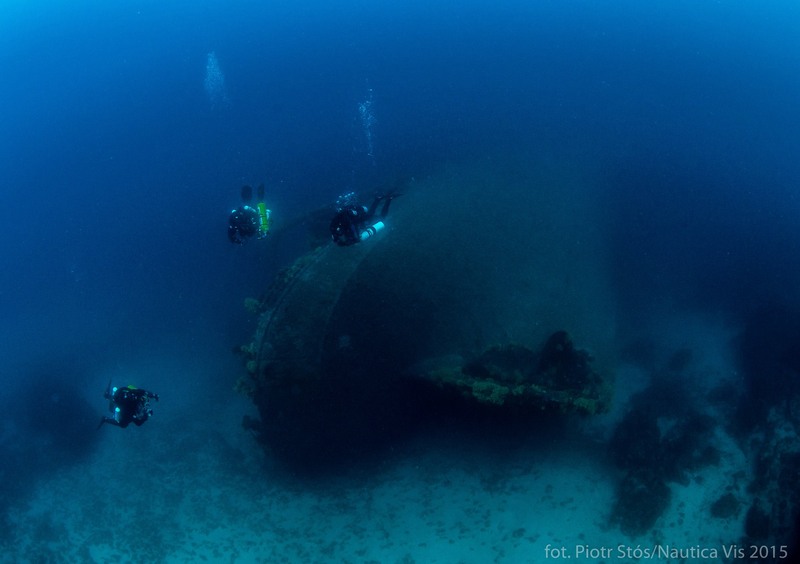 After all, it is the wreck itself, what is the most interesting object in this dive site. 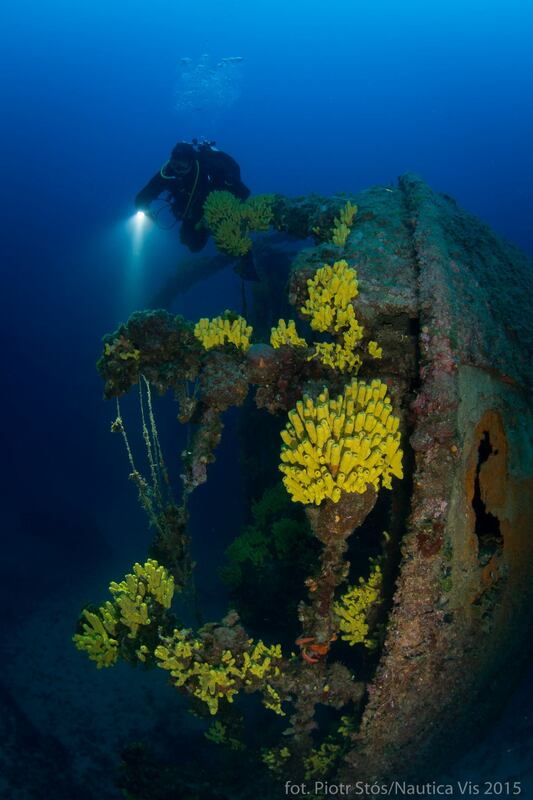 Well-preserved, lying on the seabed for nearly 90 years, has been abundantly covered with yellow sponges, and in the light of the flashlight shimmers with various colours. Pictures at cranes used for holding lifeboats, masts and the propeller are taken by all divers. 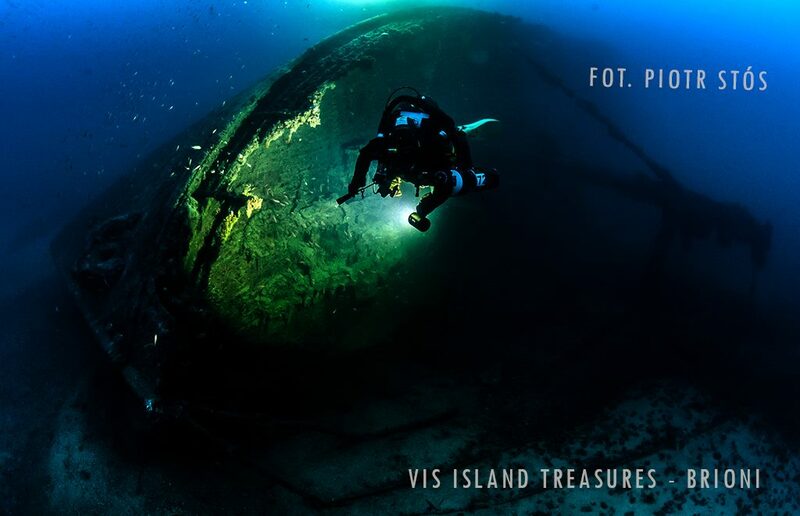 Regardless of whether the divers made decompression diving, exploring the entire wreck, or just „touched” it, escaping from decompression to the nearby wall, diving on Brioni belongs to the most beautiful wreck dives on Vis.